Barefoot Gen 2 is a film you probably should not see without having seen the first one. That being said, Barefoot Gen 2 is not nearly as good as the first one besides. The art, here as in the first one, is still one of the key strengths of the movie. While the character designs are a little different - the story takes place three years later, after all - the art is near the level of the first movie, though still not quite as stellar overall. The advantage this movie has over the original partially lies in its story. In the first Barefoot Gen, you knew the bomb was coming - the movie even told you that it was, as if you were somehow unaware. However, Barefoot Gen 2 takes place three years after all that and uses that to its advantage to tell a fresh story of survivors, full of new characters who weren't in the first title. In this way too, the movie is more upbeat than the first. While there is still the desolation and people struggling to survive, the plucky kids are happy and hopeful, living for each new sunrise. This helps make the movie much less sad than its elder. That is not to say that it isn't sad, however. The movie is still dealing with the harsh reality of trying to survive in post-bomb Hiroshima and to that extent very sad - though somewhat predictable - events do occur. It seems here that the movie is more in love with its hopeful tone though, and is not interested in bumming you out. Rather, the movie is serving its important purpose - to encourage and promote a 'never give up' attitude. While the first movie did clearly expouse this, the second is much more hopeful and less dour as well. In this way, Barefoot Gen 2 is a rather different movie from the first. That being said, Barefoot Gen 2 isn't nearly as enjoyable. The story, while fresh, is still predictable in spots and simply is not as interesting or engaging as the original. Without the horribly depressing events of the first movie, the second seems significantly more upbeat and hopeful. Its not a bad thing by any means, but the movie suffers by contrast to the original. The sequel simply seems to lack the emotional power the original was able to conjur in its moments of sadness. Barefoot Gen 2 is a sensible sequel - but is not as good as the original by any token. Taking place 3 years after the original Barefoot Gen, Gen and Ryuta are still struggling to survive as Japan's economy is slowly rebuilding itself and her mother working to support food for Gen. 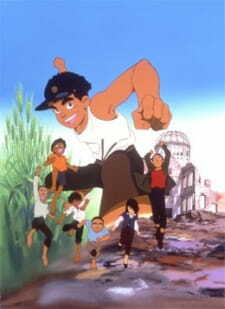 He also encounters a group of orphan children, in which their families died in the bombing in Hiroshima and Gen decides to convince the kids to be strong and have faith in themselves no matter what. Barefoot Gen talked about the bombing in Hiroshima, but in Barefoot Gen 2, it talks about the effects of the bombing known as "pika", in which it causes that person to have cancer, getting intestines broken and die. It also gives a message of hope to the audience through the eyes of Gen in this movie and the scene where he learns the words that his dad taught him 3 years ago is incredibly heartfelt in the end of the movie. The animation and music in Barefoot Gen 2 is much more improved. Madhouse gave it a nice colorful upgrade to the art style and it shows with better fluid character models and better background art than the original. Music is less corny and more subtle in the film with tracks ranging from happy to sad to just depressing as hell. The Japanese voice acting is improved and the new voice actor that plays Gen was excellent in his performance and also, no sh*tty dub to ruin this film unlike the original Barefoot Gen English dub that almost ruined the film for me. Overall, while not as good as the orignal, Barefoot Gen 2 still manages to be a damn good sequel, with all the heartbreaking emotions that the original had in this sequel.